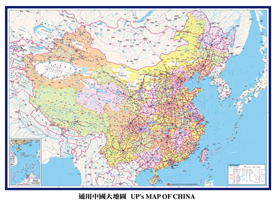 Bilingual in Chinese and English with full of new railways and roads, this map is drawn to a scale of 1:5,400,000. It can be written and wiped by white-board markers. Hanging map comes with hanging scrolls and movable hooks.